Outdoor activities are essential grounds for a successful practical life. In outdoor activities, the children are taken out of the school to the areas of adventure, appreciation of art and culture and the places of historical values. These activities are an integral part of our curriculum. At Accord School we understand that children need the freedom and time for play. Sports and games, music, art, singing, dancing, recitation, speaking and debating and theatre are opportunities to allow talent to discover itself and flourish. Engendering in children a love for creativity and creative expression is the means of molding complete individuals. 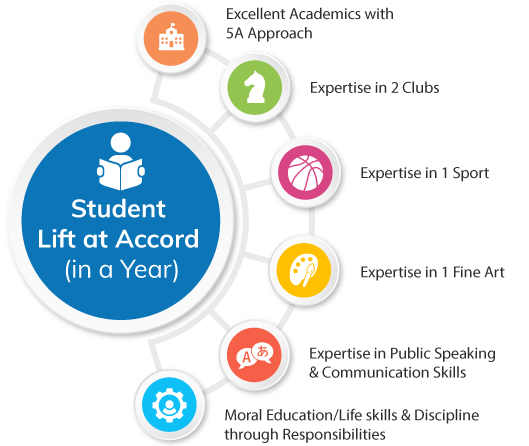 To this end, Accord School has full-fledged play fields and the most modern amenities for co-curricular activities. Trained teachers will supervise and coach the children in sports and the fine arts and train them for competitions at various levels.